Chasin’ Gus’ Ghost won a 2nd place Reely Award in the Documentary Competition at the Tupelo Film Festival! Thanks very much to the Tupelo Fest and to all who attended. For more info see the link below. Chasin’ Gus’ Ghost will be screening at the 2008 Tupelo Film Festival in Tupelo, Mississippi. The festival takes place May 15 - 17, 2008 at the historic Lyric Theater. CGG will be playing Saturday, May 17th at 4:45PM. Chasin’ Gus’ Ghost will be screening as part of a benefit party for Independent Pictures’ Film Production Internship Program. See postcard below or screenings info for more information. *Film screening only tickets are available for $15. CGG director/producer/writer Todd Kwait was featured on the March 5th edition of WKSU News in Cleveland. Listen to the segment here. 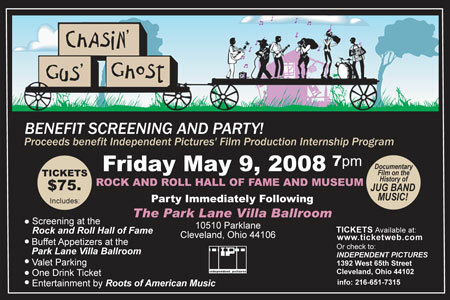 The Cleveland International Film Festival has honored Chasin’ Gus’ Ghost director Todd Kwait as one of its “Local Heroes” for 2008. To read all about it, follow the link below. Chasin’ Gus’ Ghost director/producer/writer Todd Kwait will be on the syndicated radio program ‘The Grateful Dead Radio Hour’ starting this Monday, February 11th. Check the website below for specific airings in your area. CGG has been selected to play at the 2008 On Location: Memphis Film Festival (formerly known as the Memphis International Film Festival). The festival is set to take place from March 27 - 30, stay tuned for specific screening times and locations. We’re very excited to be showing the film in Memphis- the city and the area around the city served as a large focal point for our filming. Hope to see you there! Chasin’ Gus’ Ghost will be screening at the Village East Cinemas in Manhattan on Friday, February 29th at 8pm as part of the New York Film and Video Festival. Check the link below for more info. Chasin’ Gus’ Ghost has been accepted into two great film festivals happening in the next two months: the New York International Independent Film and Video Festival in New York City from February 28 - March 6th and the Cleveland International Film Festival in Cleveland from March 6 - March 16. Stay tuned for specific screening times, dates and locations and check the websites below for more info!